A lyrical and loving tribute to the salt marshes of Georgia and South Carolina, The World of the Salt Marsh focuses on the conflict between development and the delicate ecology of the salt marshes. 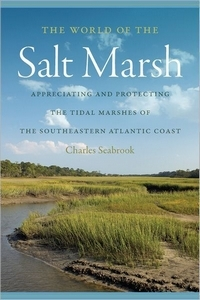 References to the history of the Revolutionary and Civil Wars and the poetry of Sidney Lanier make this book written by Johns Island native Charles Seabrook a highly pleasurable and informative read. Seabrook’s love of the marshes is wonderfully illustrated by stories of his boyhood on Johns Island. He invokes Lanier’s poem â€œThe Marshes of Glynnâ€ throughout the book underscoring the importance of an artistic appreciation of the natural treasure of the marsh. He also visits with other natives: shrimpers, oyster harvesters, clam farmers, members of the Gullah- Geechee community living on isolated islands and shares their tales with us. Seabrook meticulously documents the biology geology and chemistry of the marsh in an eminently readable style. From the role of spartina grass, the periwinkle snail, fiddler crabs and the mud itself, we wonder with him at the amazing rhythms of this tidal system. It filters, regenerates, absorbs toxins and provides nutrients for many stages of animal lifeâ€“ truly an incredible chemical system. We travel with scientists as they pursue the mystery of massive marsh diebacks in the 90s which makes clear how little we know as well as how easily the delicate balance of our tidal marshes can be disturbed. The role of real estate development on the coast is generally not a happy story as Seabrook tells it. He recounts tales of developers with a single minded focus on maximizing density and proximity to coastal marshes. They routinely downplay or ignore evidence of the sensitivity of marshes to the consequences of clear cutting, filling in and overdevlopment. He attributes South Carolina’s and Georgia’s emphasis on â€œproperty rights as a religionâ€ to developers’ frequent success in using the courts to override environmental regulations. Even more horrific are his stories of industrial development on the Georgia coast where pollutants were persistently mishandled in the 70’s through the late 90s â€“ resulting in recent observations of highly toxic levels of these chemicals in dolphins, shorebirds and fish. Seabrook argues that there are adequate regulations at the Federal and state levels, but the lack of will and limited resources lead to limited or no enforcement of existing regulations. The ACE basin in South Carolina is touted as a model for success. Property owners, government agencies and conservation groups such as the Nature Conservancy, Ducks Unlimited, the South Carolina DNR, the US Fish and Wildlife service banded together in 1988 to prevent a massive real estate development on Edisto Island. Led by forward looking property owners, conservation easements were placed on much of the property on the island and conservation groups purchased additional land. In his epilogue, Seabrook offers recommendations at the state and county level, neighborhood and household level. They are simple and not unfamiliar. Yet after being immersed in Seabrook’s marsh â€“ its beauty, people, history, wildlife â€“ and how this wonderful system continues to rebound after our mistreatment of it â€“ he leaves us newly inspired to do what we can to save it.